What if Sherlock Holmes was actually a master criminal? A clever reimagining of the Canon from a different point of view. Read a review at Sherlock Peoria. What if Sherlock Holmes had turned to crime instead of detection? 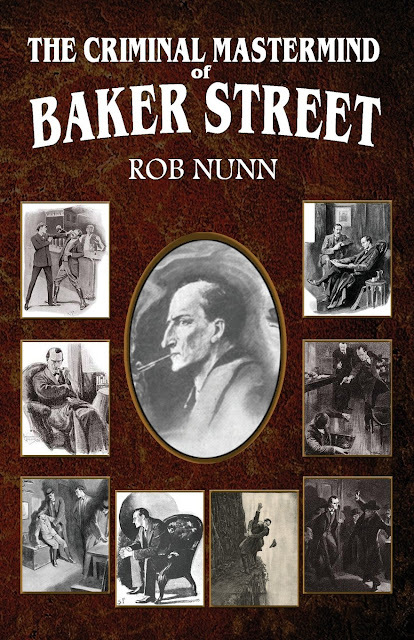 THE CRIMINAL MASTERMIND OF BAKER STREET by Rob Nunn investigates this very concept. Holmes famously said that "when a clever man turns his brains to crime it is the worst of all." A sinister influence is at work in Victorian London with Sherlock Holmes and Doctor Watson running a hidden criminal empire. THE CRIMINAL MASTERMIND OF BAKER STREET explores all of Sir Arthur Conan Doyle's original stories through the lens of Holmes as a criminal while adding many new exciting tales of Holmes' daring to delight its readers.